The much anticipated production of the sixth generation of the Mustang is finally underway! Whether you already ordered one or not, you can appreciate the fact that the 2015 Ford Mustang has officially begun production! 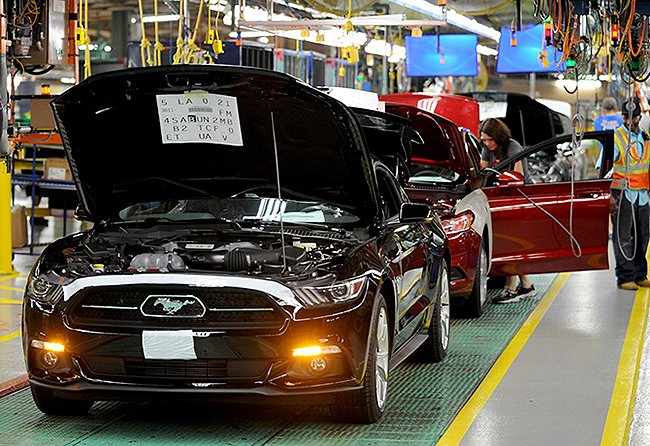 First reported by Mustang6g.com, the much anticipated S550 platform hit the assembly line at the Flat Rock Production plant on August 28th, 2014, marking the beginning of the next generation of the iconic Pony car. The 2015 Mustang is more than just an update or remodel of the 50 year pure-bred, it marks the beginning of a new chapter in Mustang history. For the first time ever the Mustang is leaving the confines of the North American market and becoming a globally offered vehicle. The 2015 Mustang is going to be sold in over 120 countries giving it an international presence that the Mustang community has never seen before. This is arguably a long overdue offering, as reception of the Mustang in foreign markets has been overwhelming; when the order banks opened up in Europe the 2015 Mustang sold out in 30 seconds. Ford is offering 3 different engines out of the gate for the 2015 Mustang; a 2.3L EcoBoost, 3.7 V6, and the infamous 5.0L V8. While this is not the first time we have seen three different engine options for the Mustang, this is the most we have seen a 4 cylinder option marketed to the Mustang community. Ford has had a huge push on for the turbocharged 2.3L, using it as the main demo vehicle for dealers. Having so much of a focus on the EcoBoost option is partially due to the Mustang now being a global vehicle and also various factors relating to fuel efficiency. Between there being a push on cars being more fuel efficient by 2016 as well as consumers being more concerned about paying at the pump, it is import for the 2015 Mustang fuel economy to be competitive with its in class competitors. Fuel economy aside, the 2015 still has a strong focus on performance and power. The S550 Mustang Horsepower ratings were released earlier this summer, quieting any concerns there may have been about the Mustang losing power. While there were only minor increases in power over the S197’s power ratings, they still provide enthusiasts with an amazing platform that will easily land you in trouble with the law. The one engine that we are still waiting to get information on is the Voodoo engine that will be powering the GT350 Mustang. We are still waiting for the exact date of when the 2015 Mustang will arrive on dealership lots. Some Ford representatives have said that we can expect them to arrive in early November, however, now that production is well underway at Flat Rock I think we may seem them a good bit sooner. I think a possible late September or early October is much more feasible as an expected delivery date.